At any barbecue joint worth its salt and pepper, you’re ordering by the pound. And when you’ve walked away from the chopping block, odds are your eyes were bigger than your stomach. 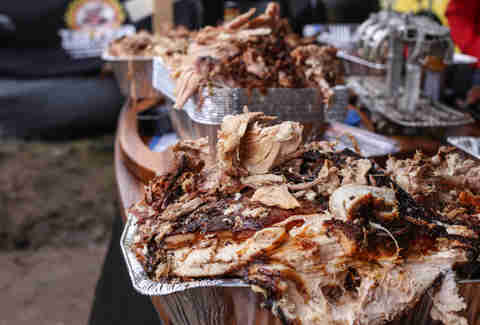 To find out how to keep those leftovers tasting fresh, we asked an esteemed group of barbecue gurus from around the country to give tips on reheating their signature items. Follow their lead to maximize the majesty of your day-old meats. 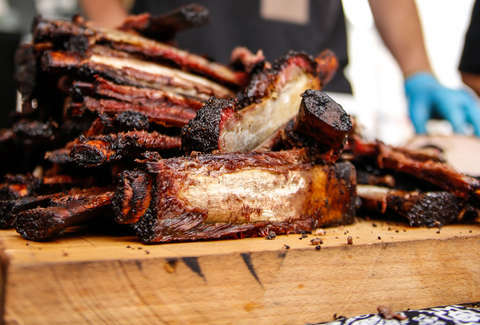 The beef rib is the current darling of the Q circuit, and while it may seem like the only way to reheat one of these Brontosaurus bones is over a Flintstones fire, Ronnie Killen of Houston's most-lauded BBQ joint says otherwise. Put it in a baking pan with about 1/4 cup of water, cover with foil, and bake at 225℉ for 30 minutes. 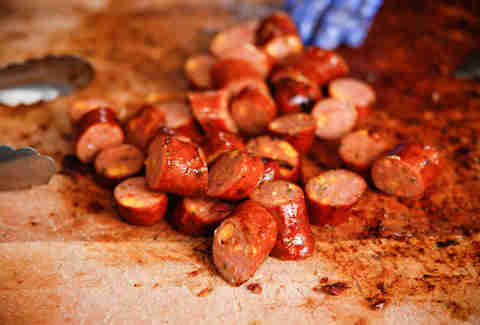 Meats with a high fat content reheat easier, and sausage is on the chubby side -- it has an average 30% fat content. The folks from Iron Works say the most practical solution is simply microwaving, but for best results, zap in small increments. And be sure to turn/flip the meat halfway so that it's evenly cooked. 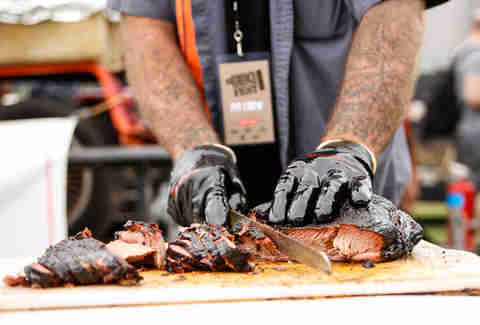 When it comes to perfect Texas brisket, simplicity is key. 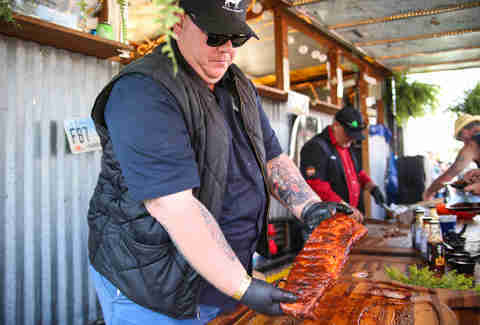 John Lewis from La Barbecue recommends you wrap your leftovers in foil and heat them in the oven at 200℉ until the meat is warm all the way through. Head ShedHed Brad Orrison shared some tips on transforming leftovers into much more. For turkey, pull it like you would pork, and then put it in a bowl with salt, pepper, and sauce. Zap it in the microwave. Then, toast two pieces of bread. Top the bread with meat, veggies, and provolone, throw it in the toaster again, and watch that cheese melt. You now have a beautiful open-faced sandwich. When it comes to ribs, pull the meat off the bone and heat it in a pan with a little bit of unsalted butter. Make a batch of fluffy biscuits, cut one in half, and fill with rib meat. 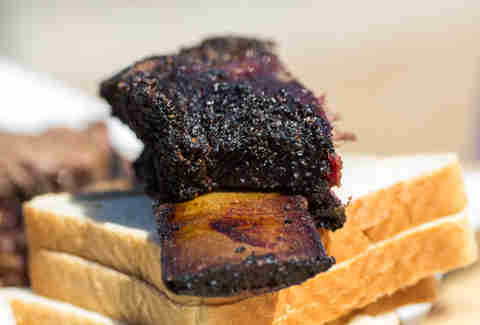 Add cracked pepper, grab a cup of coffee, and enjoy ribs for breakfast! Hog honcho Ken Hess from legendary Big Bob Gibson's says that if you've got full cuts of pork, a low oven at 225℉ does the trick. But should you have a ton of pulled pork left over, the move is to freeze it in a Ziploc bag. Then when you're ready to reheat, place the bag in a pot of water that's near a boil, but don't let it boil. This seals in the moisture. You can also add sauce to the bag to hit it with another round of flavor. Then throw it on nachos, pizza, soup, or a casserole, and any of those items become infinitely better. In Eastern North Carolina they serve their pork chopped to keep some crispy skin on the meat. Sam Jones from Skylight says that if you put that pork in the oven, you'll lose the crunch and end up with meat the consistency of sawdust. Instead, slowly reheat it on a stovetop. And don't stop stirring. Dan Gentile is a staff writer on Thrillist's National Food and Drink team. He is based in Austin, TX, and as evidence of his regional BBQ bias, has hundreds of photos of brisket, but none of pulled pork. Follow him to salt and pepper at @Dannosphere.